Today, we're discussing a very broad topic: Approaching New Patterns and Concepts. I consider myself an intermediate sewist/quilter but I still try new things all the time (to me, that variety is why I love to sew so much!). 1. Search for a good online tutorial with clear pictures. It's unbelievable how much stuff is out there! 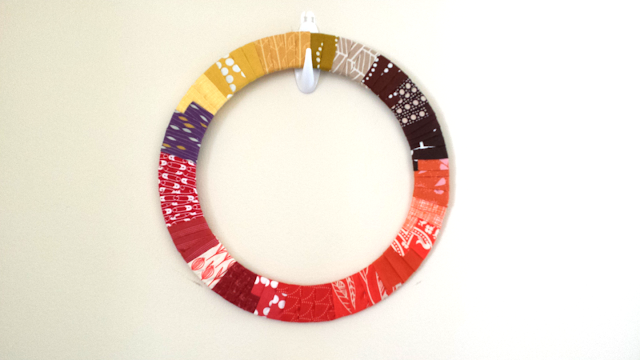 When I made my fabric wrapped wreaths, I combined two tutorials that I found helpful. If I can't find a tutorial I like or if one hasn't been written, I'll write my own for my blog. I do need to get better at that, though (finding the time and actually writing more tutorials) - I'd like to send back a little love. The last tutorial I wrote that I couldn't find much about beforehand was my Overlapping Circles Machine Quilting tutorial. 2. Alternately, you can buy a pattern and use the suggested tools/methods. I've bought a few patterns because they are excellent, and because they are more detailed than tutorials (for the most part). Sometimes I find a way to change what the pattern says and it works, but I only do that when I feel confident. For example - the Curlicue Crush pattern explicitly explains how to sew curves with pins, but I tried it several times, and I just couldn't get it. I learned how to sew curves pinless from Leanne, and I was off! 3. Ask a quilter or sewist who has experience. Example A: currently, my mind is boggled by reverse applique on a bee block for the Central Jersey Modern Quilt Guild. When we meet on Tuesday, my friend Sandy is going to show me what to do. Sometimes the directions and pictures given to me don't do as well as seeing it live. Example B: I want to start sewing clothes and my friend Amy (hi Amy!!) knows how! She's been throwing tips out at me. I've suggested a tradeoff: she should teach me how to sew up a voile shirt, and I'll teach her FMQ :) Lol! 4. Take a class on a topic you want to know more about. Okay, I haven't done this one yet - you caught me. I'd like to take a class sometime - in my case, I live an hour away from my LQS, so it's not something I can do on a regular basis. Chances are good you'll also meet someone there who you can sew with outside of class, or who can help you more (see Point 2). 5. Utilize social media to your advantage. This also goes with Point 2. If I'm doing something totally knew, you can bet I'm either on here, Instagram, or Flickr, asking for advice. This is especially for when the husband's expertise or opinion just isn't enough (sorry, sweetie). But really, ask, and the masses shall answer! Or so I've learned. You guys are the bestedy BEST! 6. Keep a catalog of things you want to try, and revisit it when you need to. Thanks to Pinterest for turning me into an online hoarder. Lol. But really - I reference my boards all. the. time.! Another new venture this year - the "maxi" skirt. I just went with it. So happy I did! 7. I take a deep breath, and I just DO IT! Stop worrying about if you are wasting fabric. Stop worrying about how much time it will take. Just do it. You took the plunge. That's what matters. Even if it doesn't look like that Pinterest page... you did it! Now it's your turn! All link ups have a chance to win one of two fabric prizes in February from 1 Choice 4 Quilting and myself! You can also still link up your goals here. I recently bought an old Singer industrial machine, table and all. It's from the 20s or 30s, we think, and it sits in an oil pan and self-oils. We're still in the process of cleaning it up and all, but the distance from needle to machine is 11.4", which is huge compared to my current 7.4." I'm hoping this will help me tackle more whole-quilt machine quilting -- a "new" thing I'm going to try with an old machine. I'm sure at some point I'll let you know how that goes! My first quilting teacher once said, "why pay for classes if you're not learning anything new?" So it's my plan to make 2014 the year of learning new things! Best post yet! You have covered sew many great tips here, Jessica! You are an inspiration to me! Another great post in this series! I especially love the tip about "stop worrying about wasting fabric." It took me so long to get blase about using my fabrics but I got there this year--and you know what I learned? I am a quilter. If I totally screw up a project, the worst that I have is scraps. Welcome to another edition of "Things Eliza Wears Every Day!" Today we're taking a look at the Timberland boots Timberland Outlet online I bought before going on trip to Iceland in November that I have not removed since. That's barely an exaggeration. Breaking them in was admittedly painful — blisters everywhere —Timberland Sale but once I did, they promptly became the most comfortable shoes I own.